As the temperature fluctuates from freezing to balmy here in Toronto (today was 7°C, and just 5 days ago it was -27°C with the wind chill! ), I’m relying more and more on my merino tops, both long- and short-sleeve. They’ve become a multi-seasonal staple. And if there’s one thing I regretted about the Camino, it’s that I didn’t have more merino wool clothes with me. Not that I wish I’d packed more clothes. Gosh, no. The trick to walking the Camino is to bring as little as possible – one set of clothes to wear and one set to change into when you get to the hostel – and do laundry daily. Witness what’s in the photo above – that’s all I packed! Literally, one set of clothes, my sleeping bag, a teeny quick-dry towel minimal toiletries, sandals and my water bottle!!! Lesson: The best gear will multitask, performing well in different weather conditions. My merino wool staples: an Icebreaker Retreat tank and Meridian T-shirt, and a Smartwool long-sleeve zip T (which I bought in Ponferrada, Spain). And that’s why I wish I’d bought more merino before going (instead of buying along the way). Merino wool would have kept me warm and cool. Since it’s odour repellant, it doesn’t need to be washed often; and when you do wash it, it air-dries in a couple of hours. That would have saved me the hassle of trying (unsuccessfully) to dry clothes overnight or on my pack while walking. My new go-to shirt – year round – is Icebreaker's Meridian Superfine 150. I originally wanted to buy this T-shirt for a family camping trip to Algonquin in early July, but couldn’t commit to the hefty $70 price tag. I could justify spending 60 euros on my beloved SmartWool tee because it was versatile – a heavier weight with long sleeves and a zipper – and, heck, I bought it in Spain when desperate for an extra layer of warmth at night in the uninsulated pilgrims’ hostels on the Camino. But $70 for a short-sleeve shirt seemed ridiculous. Yet still newly in love with merino wool and all its benefits, I scored the Meridian for a midsummer cycling trip along Ontario’s Lake Huron. Again, in case you missed the head: Best. Purchase. Ever. No. 2. The Meridian is surprisingly perfect for summer’s humidity, as merino wool is breathable and has natural wicking properties. Though lightweight (Superfine 150), it’s also quite warm in cool conditions, ideal for chilly summer nights. Believe me, I wore it under my SmartWool every night, and it kept me warm as a base layer. And being merino, it didn’t smell from continuous use, and it dried in an hour when I did wash it. With a feminine cut, deep V neck and short raglan sleeves, the Meridian is flattering on a petite gal with curves, as the hem sits just under the hip bones and is slightly longer in back. One caveat: The fit of my first Meridian T-shirt is better than my more recent purchases. Rumour has it that Icebreaker switched manufacturers, so this year’s Meridians fit looser than the 2010 ones. That would explain why my Jungle tee is shorter and more fitted than my Mystic and Fiesta ones, though they’re all supposedly the same size. Keep that in mind if you’re it ordering online. I can’t wait to see what juicy new colours Icebreaker rolls out next year! And in the meantime, check out my Best Purchase Ever No. 1, a shirt I’ve worn through spring, summer, fall and now winter. Another advantage of merino is that it packs small. The Way of the Lightweight Backpacker reveals how, thanks to merino, I’ve narrowed down my packing list to 18 things. Friend and blogger Brooke Stevenson of My Bike Myself and I turned me onto merino wool last winter, when we were away on a ski weekend and all she had in her teeny day pack was a small compression sack stuffed with a handful of clothes. Merino, of course. She raved about how fast merino dries, while I was unsuccessfully trying to air-dry that day’s sweat-soaked recycled-polyester long johns and undies. Amazed by her multifunctional, minimal weekend wardrobe, which was pressed into service during and après XC, I gave in a few months later and shelled out for two Icebreaker merino undies (a whopping $32 each, and worth every penny) and three pairs of SmartWool hiking socks ($20.50 each at MEC) for my Camino trip. The socks aren’t merino, but Brooke swears by them, so I rationalized that my feet would thank me after walking at least 20 km a day for weeks. But even with liner socks, I immediately got blisters, having erroneously bought a size up. Fortunately, in Ponferrada there’s an awesome hiking/camping gear store a mere minute from the Templar castle, and it was with relief that I eagerly stocked up on three pairs of extra-small SmartWool socks and much-needed flipflops (and promptly shipped my too-large socks and blister-irritating Keen sandals ahead to Santiago!). And that’s when I got greedy. I scoured the shop for merino anything, settling on a SmartWool NTS Midweight Zip T in Purple Heather. Best. Purchase. Ever. At 60 euros, it was a splurge, but boy did I get my money’s worth over the next two weeks! I wore it day and night the rest of the trip, washing it only once. You’d think it might smell, but nope. You’d also think it was totally stretched out. Also no. You’d think I’d have to roll up the long sleeves and tuck the hem under, as I have to do with most tops, which are always too long for my 5’1″ frame. Gladly, no. A nice medium weight and with a half zipper and mock neck, it also kept me cool when hiking, warm when sleeping – the perfect multitasker! So when I returned home and readied for a 10-day camping trip, I immediately ran out to buy Best Purchase Ever No. 2. No, this isn't me, but the SmartWool model wearing my favourite travel shirt. Though it seems to fit her long limbs, the body and sleeves are actually the perfect length for a petite frame. 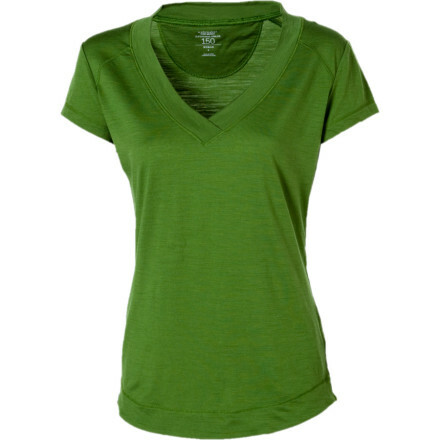 Another cool thing about merino is that it packs small and stays relatively wrinkle-free. 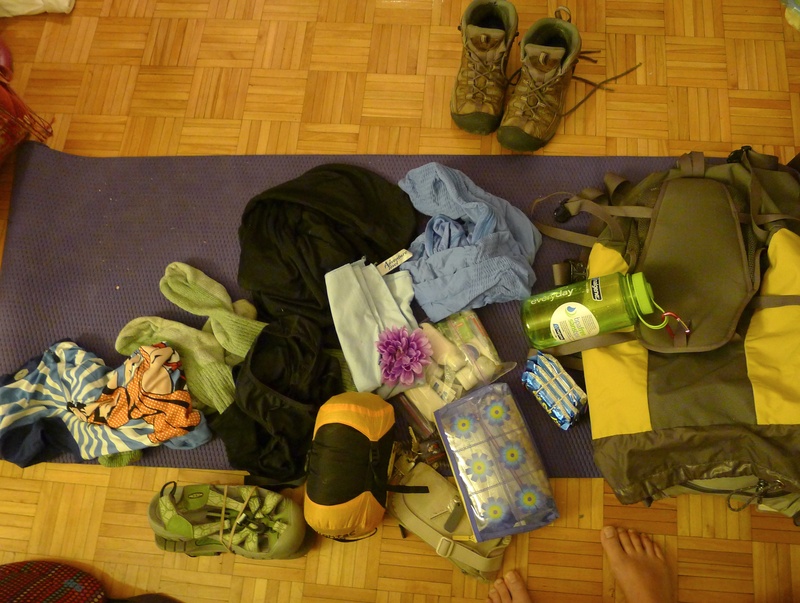 Learn how merino helped me pack light in The Way of the Lightweight Backpacker. camino, finisterre, pilgrimage, santiago de compostela, spain, travel and tourism, way of st. james. 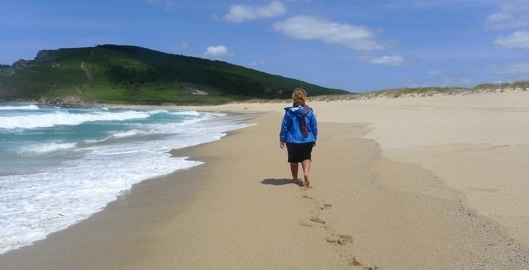 Finisterre, Spain. A moment of solitude at the end of the Camino de Santiago. I started November with a new perspective. After being given the “restructuring” speech at work, I cleared out my desk and walked home – for three hours – breathing in the crisp, fresh air of early November, soaking in the unusually warm autumn sunshine, frolicking in the kaleidoscope of glorious carmine, rusty red and golden yellow leaves as they fluttered to the ground. Yes, frolicking. Despite being thrust into the uncertainty and panic of the suddenly unemployed, I felt a definite lightness: the world had opened up before me, and my options where limitless. It was the same sense of calm and optimism I felt when walking the Camino in May. With every step, there came a rhythm, and with that, a sense of peace. And the ability to be present and in tune with my surroundings. Instead of feeling lost, I made every step with purpose. And I paused. After that first step in Astorga, Spain, many a time on that long walk to Santiago, I’d pause and simply thrill at where I was. Because no matter how hard it was to cross those mountains, I couldn’t deny the absolute awesomeness of being there. To pause and just be. The Camino taught me that. And as November continues to fall upon us, I find myself back there – a little exhausted by the challenges of the days before, not knowing what lies behind the next peak or valley, but excited about the possibilities of adventure that lie ahead.